What makes a boat show the BEST place to buy a boat? 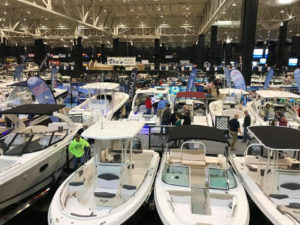 A boat show is the one place where you can compare a wide variety of boats, talk to experts, dealers and manufacturers and best of all, take advantage of special deals and incentives—including the best prices of the season—all at one time. To make the most of your time at the show, shop with a plan. These tips will make finding, and buying, the boat of your dreams easier. Use the show directory as a resource. It includes exhibitor, boat and product listings and a floor plan to help you navigate the show. Determine what type of boat you want. Visit the Discover Boating Center and talk with an unbiased expert who can help decide what type of boat will meet your needs. Visit every dealer who carries that type of boat. Review your notes and brochures. Visit the Discover Boating Center for unbiased help: The staff will answer your questions and offer brand-neutral advice on things like hull design or engine options. Narrow your options to 2 or 3 boats and revisit those dealers. If you need financing, ask if any special offers are available Before you make a final decision, compare the products and the deals one last time. You’ve reviewed your options, thought it over and are ready to buy. Go back to the dealer and sign the paperwork. CONGRATULATIONS! YOU’RE A NEW BOAT OWNER.